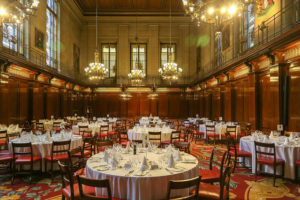 March winds and occasional heavy showers blew Liverymen and guests through darkened streets for the March Court and Livery Dinner at the unique Merchant Taylors’ Hall in Threadneedle Street. The Hall is situated behind a non-descript front door which when opened leads into one of the City’s gems. Visitors enter into high ceilinged rooms with beautiful stained-glass windows and panelling. Originally built in 1327 the Hall was burnt down in the Great Fire of London and suffered bomb damage in 1940. Amazingly some of the original walls remain underneath the wall panelling. Restored and improved the Hall is a very attractive venue. 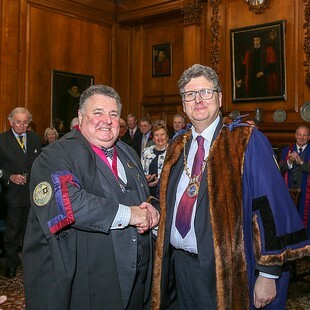 The ancient ceremony of Common Hall followed the earlier Court meeting and included confirmation of Paul Wenham as our new Clerk, admission of eight new Freemen and three new Liverymen. A new tradition was begun, in the spirit of fellowship, with special guests, new Freemen and Liverymen being given a red rose so that they were each easily recognised. Drinks followed in the Hall’s internal courtyard which, fortunately, has been adapted for all weather use with a glass enclosure. It was fascinating looking at the outside Courtyard walls from a warm and dry environment. As the Hall Dining Room boasts an organ, our own organist Past Master, Sir Andrew Parmley played the Master and principal guests to their seats. For a change from the usual long tables we were all treated to Dinner at round tables – we just had to remember when to stop the Loving Cup from continuing round! We enjoyed a high standard of victuals and wine served discretely all in the very fine, stately Great Hall. 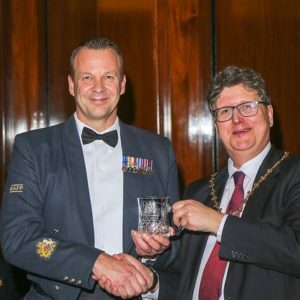 Group Captain Blythe Crawford from RAF Leeming was presented and introduced by the Master who in turn introduced Warrant Officer Morgan Price, who was presented with the Glass Sellers’ Tankard having been nominated as Best Crewman for the Year. This is a new award to cement our relationship with RAF Leeming. 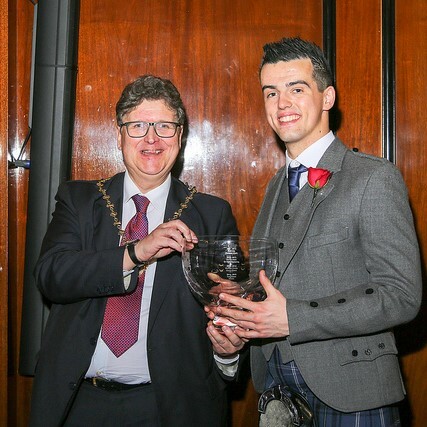 The next presentation was to the Glass Sellers Apprentice of the year 2018, Gareth Owens, from Owens-Illinois, who was presented with an engraved glass rose bowl. 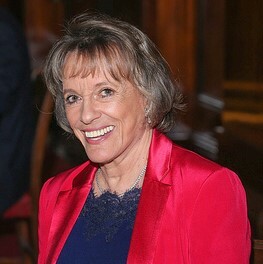 guest, Dame Esther Rantzen, as well as guests from RAF Leeming. Other guests included the Master Chartered Architect and Clerk, Past Master Needlemaker as well as other guests that included representatives from British Glass. As principal guest Dame Esther replied and she entranced us all, genuine, witty and fun she described how her ‘Childline’ telephone help line for children had been more than successful and had helped millions of children and young people with a sympathetic ear. Dame Esther then went on to describe her latest venture, prompted by her own age, a ‘Silverline’ for those often old, but who are lonely. Already this is taking off and I suspect with ‘care in the home’, is much needed. The response by the Master included a welcome to Paul Wenham now officially our new Clerk thanking him for his hard work, imagination and general energy as Acting Clerk. We wish him well. The evening concluded with another rendition on the Organ by Sir Andrew as the Master and principal guests led the way to the cloisters for a stirrup cup before venturing into the chilled night air and heading home.